Where Should I Send the Free Workbook? The online course is currently waitlisted while Jacques is putting together the newest version. Grab the first 5 days of the new course in a downloadable workbook. 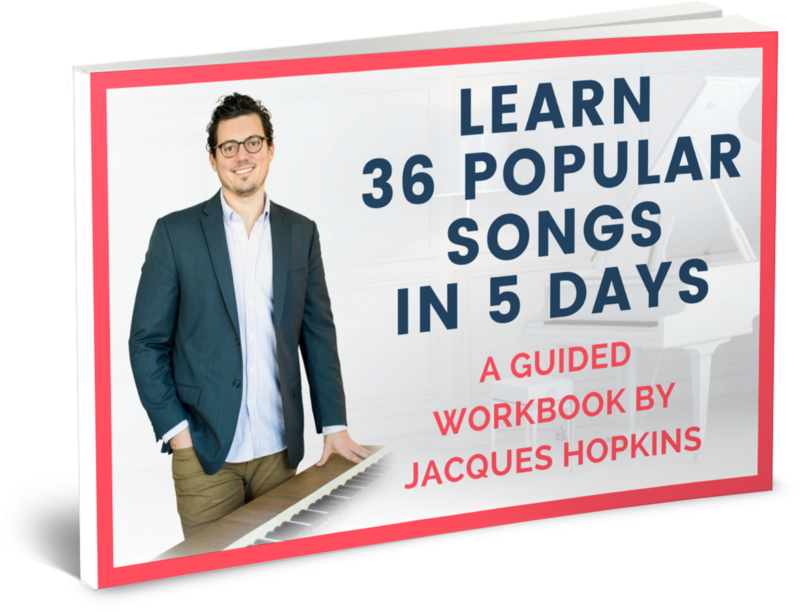 Even if you've never even touched a piano before, this workbook will walk you through step-by-step and day-by-day exactly what you should doing to start playing the songs you love. We're not talking about Mozart and Bach here. These are songs you actually want to learn how to play on the Piano: Ed Sheeran, Bruno Mars, Adele, etc. How Learning the Piano Can Take a Few Weeks to Learn (and not months or years like most teachers will have you think). How Learning New Songs (... songs YOU actually want to learn to play... ) can be Quick and Easy. "The formula for finding the chords has blown me away. I struggled with chords for so long and you made it simple. With just this book, you're 10 years ahead of my other teacher already. I'm a believer. I'm all in with your program." "Thanks for inspiration to spend more time at the piano. " "Hate having to memorize chords, scales and boring, outdated songs. I am glad I found someone with a new, fresh approach to playing the piano." "Since I starting following your tutorials now I have clear concept of piano playing. Thank you for making it so simple! " "I just managed to play along to "Wings" by Birdy. What a buzz to achieve so much in so few days!"